Everyone loves a treasure hunt. You never know what you might find. But where to start is the question, because you can’t just go trespassing across the land to dig up valuables. That kind of behaviour could get you into trouble with the law. 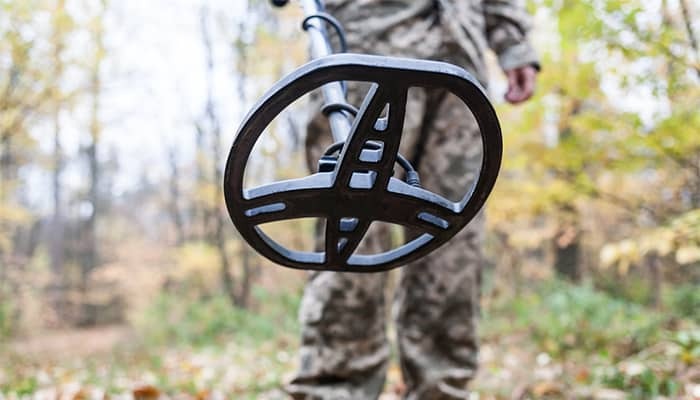 You’ve done your research and picked up the best metal detector for your budget. Before you head out to unchartered territory, take a long slow sweep of your backyard. Most homes are built on land that has been used previously. Yards are active places where we run, dig, eat and relax. That means there’s plenty of opportunities to drop something. If your house had previous residents get searching for dropped coins, jewellery or other precious objects. Even if you have a new build house it doesn’t mean the land hasn’t been used before. It may have been an old settlement, farmland or a building site. The old metal detecting adage goes ‘Where’s there’s people there’s treasure’ so never assume you won’t find anything. Try burying a few coins, rings and old tins. Listen carefully when the beeper sounds each time. If you hone your skills you’re more likely to hit the jackpot when you’re out and about, not to mention save energy digging up old Coke cans. When you’ve made a proper sweep of the yard offer your services to friends and family – it would be rude not to! In fact, if they know you have a detector, they may be working up the nerve to ask – so save them the bother by offering first. When you’ve finished with your garden, take a walk around your neighborhood and look for large older gardens. Knock and ask politely, or if you’re shy write them a note. They might be keen to find what lies beneath. Beaches are great places for activities such as swimming, soaking up the rays, fossil hunting and yes metal detecting. In fact, you’re highly likely to find something metal on the beach because beaches are regularly and actively used by the public. Cold fingers, slippery sun lotion, and hot sweaty sports can lead to objects working loose or falling from pockets. Scan the towel line, that’s the area where sun-worshippers lay out their towels, and look for dips or troughs in the wet sand. If you find something there keep scanning the area because wave action tends to sweep objects into the lowest point. Experienced metal detectorists call these’pockets’ and they’re little gold mines of lost phones, coins, and rings. Always get permission on a private beach. Public beaches may also need a permit. Check your local town’s website for details – don’t get caught out or you might face a fine. For advice on the best beach metal detectors, see here. Following the adage ‘where there’s people there treasure’ scanning your local park comes high on the list. You are likely to need permission before detecting and digging in a public park, so do get the documents you need first. Parks are great places for finds because people congregate in them for gatherings such as fetes, concerts, and sporting events. Loose coins litter public parks and the savvy metal detectorist can amass a fair amount of tips there. Increase your chances of a find by thinking about where people have used the grounds. Under a tree, around benches, is there a kiosk or was there a kiosk? These are all good places to scan. Most treasure hoards have been found in farmer’s fields. This is because over the years human activity has hummed around trading posts, burial grounds and training grounds. A bit of research will show you which fields are the most likely to contain historical activity. Look on old maps for deserted farmhouses and ancient meeting points to pinpoint a likely spot. You must have permission to detect in a private field – it’s not much fun listening out for ‘Get Off My Land’ plus if you’re in contact with the farmer they can tell you when they’re planning to plow. Plowed crop fields are excellent areas for metals detecting because the soil is dug and raised to the surface. 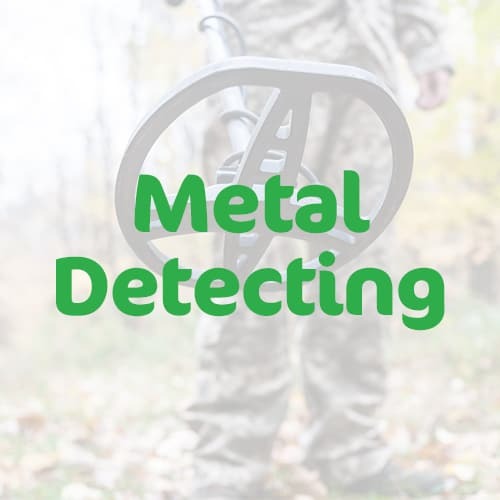 This can bring up all manner of hidden metal objects just waiting for you to find them. Woods were traditionally used as meeting places and footpaths have carried a lot of traffic over the years including dog walkers, horse riders and hikers. We didn’t always have cars to transport us around. In previous eras, we’ve gone on foot carrying our possessions with us. Think about all the years we’ve used footpaths instead of motorways – that’s a lot of human activity and a lot of potential dropped objects. Footpaths and woods are good places to detect, but as always you should get permission. ‘Public footpath’ doesn’t always mean its public property – it could be an old right of way across someone’s land. When you’re scanning a footpath go right up to the edges and beyond. As we’ve used them less frequently footpaths have closed in. It’s likely they were much wider when we traveled by foot. If you don’t scare easily scanning a churchyard can be exciting because churches and burial grounds are the oldest buildings around. It goes without saying that you must respect burial grounds and stay away from gravestones, but slowly scanning under old trees and gates isn’t intruding, and it’s certainly somewhere different! Detectorists have found ancient coins in churchyards. The giving of alms meant our ancestors took lots of coins to church with them and they often dropped them. Ask the churchwarden or priest first, maybe they’ll even bless your detector! 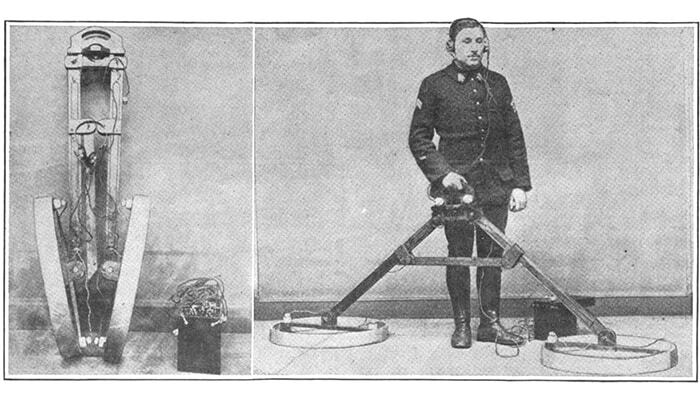 For my guide to the best metal detector for coins, see here. Human activity isn’t always profitable and there are many deserted towns and communities dotted around. Old mining towns that the population didn’t stay in after the gold rush subsided are perfect sites for exploration. Expert coin hunters suggest scanning doorways, floorboards and searching out hollow walls where folk would stash money. Another great place is a transportation town – somewhere that popped up to service travelers en-route to mining towns. Lots of trade happened at transportation towns and trade means coins were exchanged. People often in a rush to move on may have left belongings behind them. You never know – and it’s all part of the fun. Sporting events attract large crowds that sit, stand and hopefully jump with excitement. Coins and other valuables can easily fall from pockets. 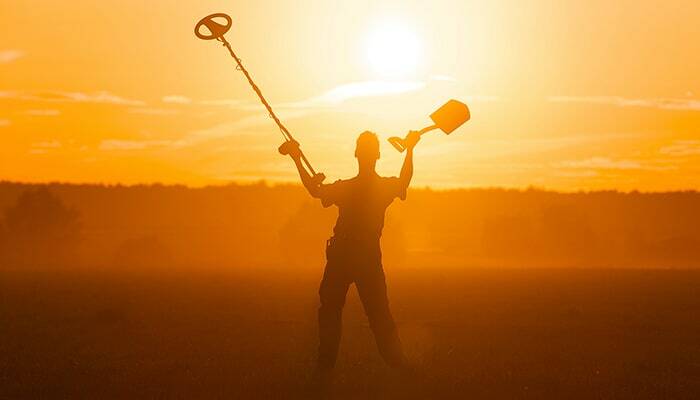 They are popular places for detectorists, so get there soon after an event for the best chance of making a million. Reading up on historical sites will point you towards areas that hosted battles during the 1861 – 1865 Civil War, or just as interesting, their campsites. There were 10,000 battles between the Confederates and Unionists and if you’re lucky enough to live nearby you can find really interesting objects such as musket and pistol balls, arrowheads, bayonets, uniform buttons and powder-flask tops. It’s likely your state has a code of practice for historical sites and wants you to report finds. Loss of historical evidence is a problem on battle sites and limits our understanding of what happened and why. 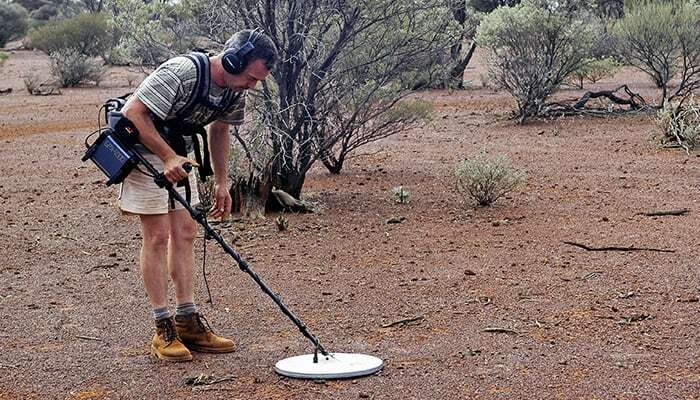 We’re living through the Internet Age so it would be remiss not to make use of the many metal detecting forums that discuss places to detect and help identify finds. Of course, no-one will give away all their secrets for fear of a metal detecting rush, but some generous folk publish tips and tricks for your local area. If you’re lucky you’ll have a local metal-detecting club to join. The experienced members will help and you’ll make new friends. It’s always more fun detecting with others because the find rate increases. If you hit the jackpot take a moment to consider whether your find might be a treasure trove. I will always check federal, state, county and local laws before searching. It is my responsibility to ‘know the law’. This law varies state to state but in general, the find must be of some value to be classed as a treasure trove – gold or silver for example. Some states such as New York and Oregon ruled finders keepers, whereas states including Idaho and Tennessee ruled that the landowner is the rightful owner. If you’re still excited about metal detecting there’s no time like the present to get out there and search for the millions of lost coins that lie scattered across parks, bleachers, churches, footpaths, and beaches. If coins don’t float your boat try looking in more specialized areas such as battlegrounds and historical sites. If I had to recommend a beginners site other than your backyard, it’s the beach. 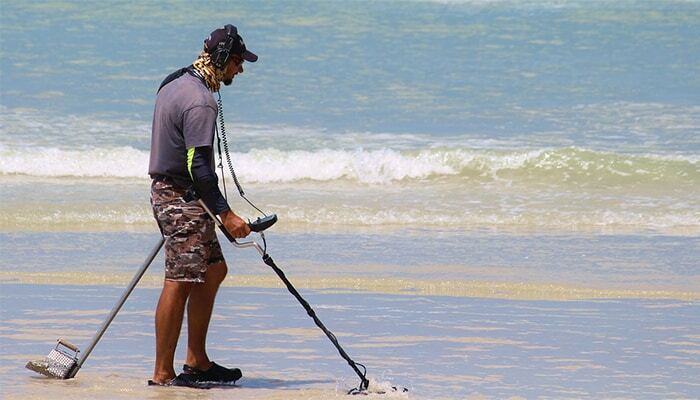 (Here are some helpful tips for beach metal detecting). With temperature changes, sports, sunbathing and a high volume of foot traffic over hundreds of years it’s highly likely you’ll find something there.